This cozy 3-bedroom, 2-bathroom, 2 car garage home is move in READY! This home welcomes you with wood flooring in the living room & an upgraded ceiling fan that is voice activated with color changing Phillips hue lights. The living room is opened to the dining room & kitchen area, giving you an ideal area to entertain your family & friends!The kitchen features all matching kitchen appliances & new flooring that flows into the dining area with walk out to back patio where you will find a fire pit, dog run, & storage shed for additional storage. To complement the rest of this home you will find a master bedroom, master bath 2 additional bedrooms & a full bath all with NEW carpet & paint! This wonderful home additionally boasts NEW water heater, NEW A/C, NEST thermostat, humidifier, NEW roof & much more! 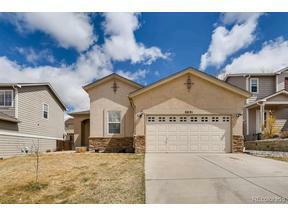 This fantastic home is in a Great location, not far from Peterson AFB, Schriever AFB, shopping & entertainment on Powers, Parks & Schools. This home will NOT last and is a MUST see!